Our today’s featured artist is PaxDesign1! Her interview is very inspiring. Let’s get to know her better and let yourself be inspired! I hail from Brooklyn NY which was a great place to spend my childhood. It was such a diverse and exciting community and also close to Manhattan. My mom was a very creative knitter and my dad’s family were professional beaders who embellished ball and wedding gowns. It was factory work and hardly well-paying, but they were unskilled female workers in the 40’s and 50’s. I remember seeing a bead loom in one of their small walk-up apartments. I was fascinated by the process and the beautiful crystals. That’s what started my passion. I also loved buttons, spools, bits of fabric, wool and wire. Anything really that I could scavenge! I spent hours embroidering my jeans and making beaded wire flowers. It was great to see my designs come to life. I became side-tracked and instead became a reading specialist. I have been teaching reading for over 20 years and still love it. No matter the age, from kindergarten to college students, I love teaching reading and writing. However, it is very stressful. I also missed the process of making wearable art. Like many New Yorkers, after 911, I took a hard look at my life and realized I needed to rediscover what was in my heart. 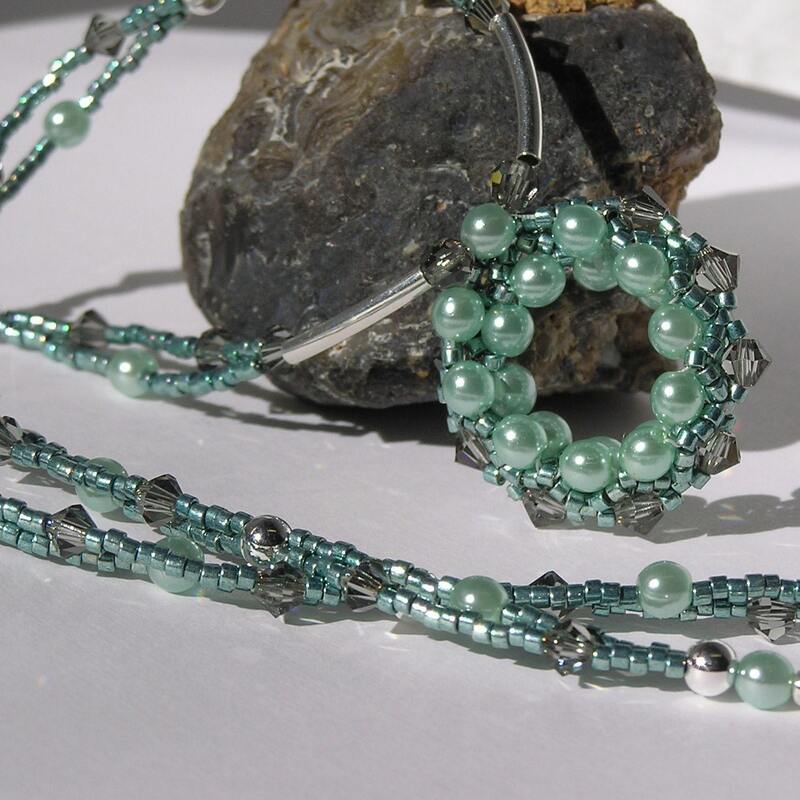 I went back to beading partly because I found comfort working with the beads. It reminded me of growing up watching skilled hands create beauty. I began making a simple bracelet for myself because I had an idea burning in my mind. When friends and family saw it, they wanted jewelry for themselves. The brand “Pax Design” comes from the Latin word for “peace”. I suppose being a “child of the 60’s” still has an affect! The logo, my smiling flower facing the sun springs from my basic optimism. “Making the world more beautiful” is slogan that has grown around the company. It is based on two important principles. I make a lot of custom pieces for hard to fit women, and that thrills me. Everyone should have something beautiful that is totally unique. The piece should express who they are. I spend time getting to know my client and help her design something that she will love for a very long time. The second principal is to affect the world in a positive way. Some of my designs were inspired by my desire to raise funds for various charities. In February, I make lots of hearts for Women’s Heart Month. I have a Breast Cancer, Hope pin that raises money and spreads the message of hope. I have gifted the pins to women I hear about who are survivors. It’s great when they pass the pin along to a woman who is newly diagnosed to give her some good vibes! When clients host a jewelry party, I donate to the charity of their choice. This truly makes the world more beautiful. My hobbies are of course art, visiting museums and galleries, my pets (Papillon dog and guinea pigs that I rescued), reading, keeping up with my three grown kids, walking and going to the beach. 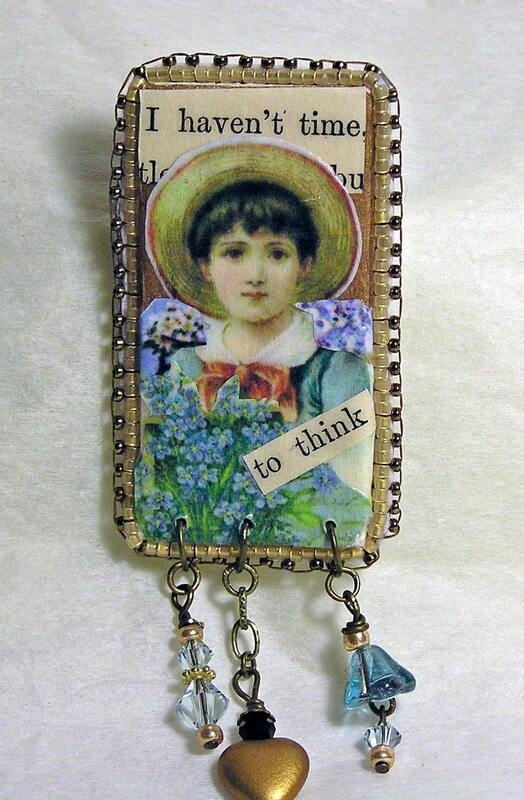 I love using vintage elements, text and found items. When I am designing for a client, I stay true to my aesthetic, but I listen and empathize with the client. What are her interests, favorite colors, lifestyle? I love doing bridal parties because the bride has so much passion and strong desire to make it perfect! Just like me. Yes, I am a perfectionist! Several of my pieces come with poems I wrote that express the concept and emotion behind the piece. I am driven by the designs I see in my mind. Some nites I wake up and have to sketch them. I wish I had more time so I could create more. I can’t keep up. As a result I usually have several projects going at once. When I work in my studio I do infuse lots of good feelings into every piece. I listen to classical music or jazz, burn incense and surround myself with beautiful images. I have postcards of beaches, artwork of friends… on my wall. I also collect “gifts from the sea” – stuff that has washed ashore (driftwood, glass, shells, coral…) that I keep on my desk. This all lends a peaceful, positive feeling to the work. I hope my clients feel that when they wear my pieces. I am passionate about fairness, self expression and positive self image. I want my clients to feel really good about themselves and the pieces. A person shouldn’t have “fit” into my designs. I make sure everything is made for them.I always resize with no additional charge. I am passionate about honoring a client’s past history and love to repair or restyle vintage pieces that belonged to a dear relative. I have taken crystal necklaces from a grandmother and made beautiful sweet 16 bracelets for her granddaughters. That was very emotional for me because I knew how meaningful the jewelry would be for the grandmother and the girls. Yes, I am an emotional person! I really believe that the brand called to me. I think I found my market in the “real world” but have yet to convey this in the online world. The big plan is to grow my business so that when I retire from teaching, I can devote myself full-time to PaxDesign. The brand has been my solace, and keeps my centered. In five years I will be almost retired! I hope to be doing craft fairs and have my website finally up and running. Tell as a bit about your shop! Make the world more beautiful with unique designs that truly speak to the wearer and help improve the conditions of those in need. Jewelry is more than an embellishment. It can be an expression of self, a reminder of our self worth and an impetus to be positive. It’s not about “trends” or “what’s hot”. It’s about feeling good about who we are. My ideal client wants to express herself. She lives in a diverse world and appreciates that. She loves color, texture and perhaps likes to takes chances with a unique piece. My client wants to wear art and understands that quality is critical. 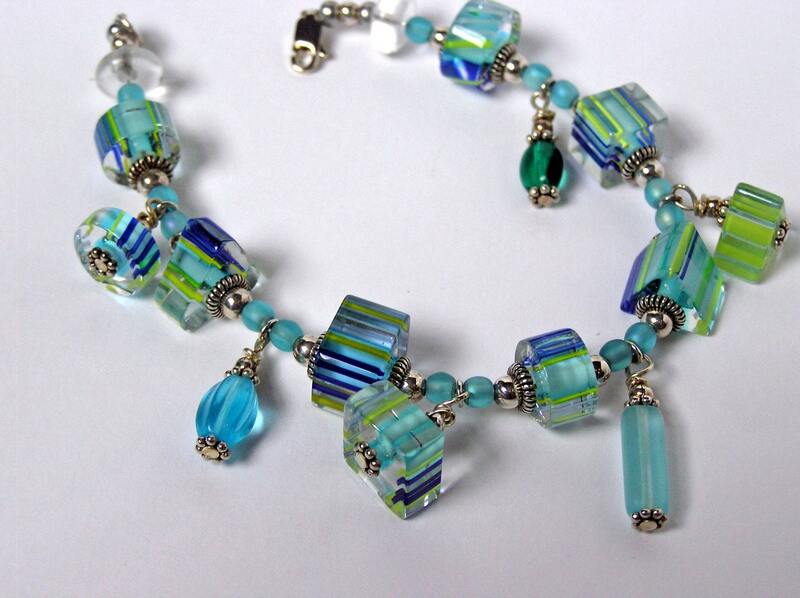 I use the best components and beads and work very hard to get it right. I will redo a piece until it is perfect. I am known as honest, conscientious, dependable and totally in touch with the client. I am new to the Etsy scene and am still trying to imbue the shop with who I am. I think my logo helps and my photos are pretty good. I work to make my descriptions accurate. My shop is unique because the pieces are unique. I try to include different items that represent my different sides. I think I have a good range of jewelry from quirky to traditional. Great question. My story is that beading is part of my history and as a result I have a respect for the craft and materials. I also thrive on getting to know my clients which is hard to do online. I haven’t made a sale yet, but when I do I will bring my client into the creative process. I have to highlight my desire to do custom work which I haven’t included yet. Again, that is something I am known for in the “real world”. I also have a great knack for repairing older pieces. I think the needs that cause them to search for PaxDesign is the uniqueness and high quality of every piece. I have ankle bracelets for brides and circle necklaces for best friends. There is a lot of emotion behind every item I make. My message is that PaxDesign is more than jewelry. Each piece is crafted with love and the highest attention to detail.